The best way to curate a small yet functional outdoor space is to declutter and keep only the basics. "If you stick to the essentials, your outdoor area will look larger," says Jamie Novak, author of "Keep This Toss That." That means making sure your backyard doesn't become a dumping ground for all the random junk you can't fit inside. What's the classic small-space solution to having somewhere to dine? A bistro table, says Darla DeMorrow, professional organizer, decorator, and home stager. "Walk anywhere in Paris, and you'll see people drinking and dining at these small round or square tables and woven chairs," she says. Twinkly string lights can liven up just about any space, but they work especially well in a small, enclosed area. 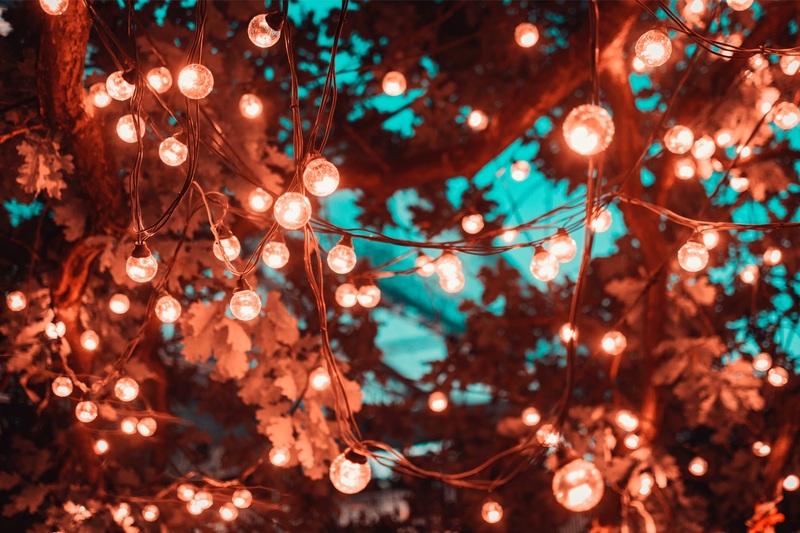 "String lights are ideal in a small backyard, because you have places to anchor them," Drew Henry of Design Dudes in San Antonio. He points out that they also help define the area and don't take up any floor space . Storage benches are a must in a small backyard—and they're even better when they have wheels. Mobile pieces can be moved inside or outside, and "Storage ottomans double as seating," Novak says. Large planters have no place on your tiny deck or around a small yard. Ceramic planters will take up precious square footage on the ground, so to maximize space, think vertically. "Stacked planters or a wall garden draw the eye upward and make use of overlooked or wasted real estate," she adds. A green wall can also beautify a metal link fence between you and your neighbor. You can also hang window boxes over the fence that divides your lot from other properties. "Get creative by hanging little herb pots or succulents on the wall," says Henry. A set of nesting tables can expand to fit a spread of food and drinks while entertaining guests. But after the party's over, you can push them back in line so they take up as little space as possible. A traditional wooden set of three nesting tables (Hayneedle, $129) will spruce up any small outdoor space. Think about adding a bar cart on wheels to your tiny porch when the weather is nice. "With a rolling cart, you don't need multiple stationary tables," says Novak. In some situations, it can be a stand-in for a side table. And a cart with sides that flip up is a total plus. It'll give you additional space to hold platters of food, napkins, and, of course, cocktails. Interior designers have touted the value of a mirror in a small space and how it can make the space look bigger. Jeanine Boiko, a home blogger at Okio B Designs and a real estate agent with Exit Realty Gateway in Wantaugh, NY, used a mirror to make a small she-shed in her backyard look larger. "It'll do the same thing for your tiny outdoor space," she says. Be sure to pick a mirror made from a metal that'll withstand the elements. "If you're on a budget, check out local garage sales, where you'll likely find a couple for a steal," Boiko recommends. A tiny backyard usually means you're smashed up right next to your neighbor's outdoor dwelling. To keep your privacy intact, put up a set of curtains made of weather-resistant fabric, heavy-duty plastic, or polyester. Or channel your inner bohemian and string up a wall of funky beads or shells as a divider.